Houthi Shiite rebels obtained secret Yemeni intelligence documents with details about US-backed counter-terrorism operations, including the names and locations of informants, the Los Angeles Times reported citing American officials. The documents were stolen when Houthi fighters took over the office of Yemen’s National Security Bureau in the country's capital Sanaa, which was closely cooperating with the CIA on various anti-terror missions. US officials claim that some files were given to Iranian advisers. At the same time, the paper said there is no indication that Houthi rebels had direct control over the US intelligence files. The compromised files reportedly affected US President Barack Obama’s decision to evacuate remaining US personnel from Yemen last weekend, including 1,000 special operations forces. The decision to leave Yemen has crippled America’s counter-terrorism operations against Al-Qaeda militants in the area. The report emerged hours before Saudi Arabia announced it had launched a military operation against Yemeni Houthis, along with nine other states. Saudi warplanes bombed rebel positions in Sanaa, with Houthis claiming dozens of civilian casualties. Following the start of the Saudi-led offensive, the White House revealed that Washington had close communication with Hadi, the Saudis, and other Gulf Cooperation Council (GCC) states prior to the launch of the military operation. It also said that Obama has authorized the provision of logistical and intelligence support to the GCC’s military operation in Yemen. Earlier, Houthi militants claimed capture of the southern seaport of Aden, President Abd-Rabbu Mansour Hadi’s stronghold. The fighters said the city was under their control and the president’s supporters were being arrested. The rebels claimed Hadi fled the country, and announced a 20 million riyal (US$100,000) reward for his capture, Lebanon-based Al-Manar TV reported. Hadi’s aide, however, said the president remains at his Aden base and is “in high spirits” following the start of the Saudi-led invasion. 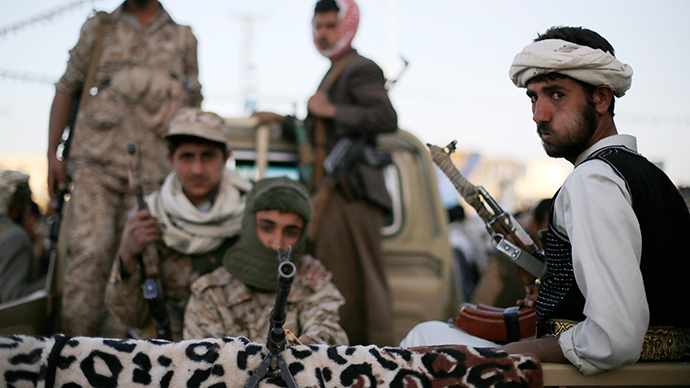 In August 2014, Houthi rebels swept down from their stronghold in the mountains, demanding economic and political reforms. In September, they seized key state installations in Sanaa. The US embassy last month closed its operations in Sanaa after the Houthis took command of the capital, leading to a situation where two rival governments in the north and south are competing for power. Last weekend, Shiite rebels seized Yemen’s third largest city Taiz.